1 Cook the pasta in boiling, salted water for 1 minute less than the pack instructions. Meanwhile, heat the oil in a large frying pan and add the courgettes and garlic, stirring gently over a medium heat for at least 5 minutes, until soft. Stir in the prawns, cayenne and lemon zest and juice; season. Cook for 1 minute more, until hot. 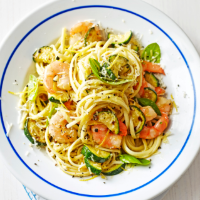 2 Drain the pasta in a colander, reserving 3 tbsp of the cooking liquid, then toss both through the prawns and courgettes. Mix in the parmesan and most of the basil; season. Serve scattered with the remaining basil leaves.